A while back, I treated myself to a subscription to America’s Test Kitchen (which is basicly an internet magazine that tests pots, pans, mixers, knives, and all sorts of kitchen toolage, but they give you a side order of recipes from a sister site as well). One of the recipes they had was for a braised turkey dish, where you broke down the turkey, roasted it at a high temp for a while to brown the skin, then braised it to finish. Tried it, and it sortof worked – the turkey was like sponge instead of dry shoe leather. I knew I was cooking xmas dinner this year and I had an earlier recipe in mind as well, so I bought a few turkey breasts over a month or two and tested some ideas, and here’s the end result, which I used for this xmas’s dinner to some success. Warning: There’s no turkey skin. I don’t care – I think people who eat skin are wierd. So no complaints. Besides, there’s an easy solution. Buy a second turkey and roast that for the skin! To start with, my family rarely get to the legs during xmas dinner, and I really hate picking over carcasses for dark meat the next day, so I figured why waste it and I just ordered a turkey crown this year. Hell, herself and myself together can’t finish one turkey breast, so why not, especially when it wasn’t the only meat dish (there was beef wellington for xmas dinner as well). BTW, this recipe works well with just a turkey breast too, so for smaller roast-type-dinners this is pretty good too. My order didn’t quite go as cleanly as planned – to me, turkey crown means two breasts still attached to the keelbone, but with the rest of the carcass removed. To my butcher it means a turkey without the legs but everything else still attached. So I had to start with some basic butchery, and I just peeled the two breasts off the carcass. Normally I’d make stock with the carcass, but I’d saved a few litres of the stuff from the practice runs to make the jus without fuss today, so I just discarded it (it’s xmas, all my pots including the stock pot are in use – I don’t recommend this as a regular thing though, just chuck it in the stock pot and don’t waste it). Bring all this up to a boil, stirring to ensure everything dissolves (everything that will dissolve, that is, you’d be a while waiting for a sprig of thyme to dissolve), and then turn off the heat and let it cool. Meanwhile add a 2kg bag of ice to a suitable container (I use a plastic box, I’ve used a bucket and a stock pot in the past, but basicly something clean and waterproof). When the brine liquid has cooled fully (fully please, there’s no mess like a brine melting out of the container), add it to the ice and mix well; then add the turkey to the liquid. Close the container and stash it somewhere cool overnight (if you stash it outside – and I have – be sure the cat can’t get at it by weighting down the lid). The next day, take a deep roasting tin. I had to go search for mine, its a good 8.5cm deep. Your average roasting tin won’t cut it for turkey breasts (they’re usually fine for chicken though, and this should work for chicken too). Break down two large white onions, four or five ribs of celery and three or four carrots – exact amount depends on the size of the ribs/carrots, but you’re trying to end up with roughly equal amounts of all three (that’s not a standard mirepoix, but it works for this recipe). Mix these in the roasting tin (note that the tin here is cold; this isn’t a case of heating it in the oven and then chucking in ingredients, like you do with roast spuds). Now add in four or five cloves of garlic (cut in half and the bitter green spout removed, but not smashed or diced). Now remove the turkey from the brine, and rinse it with cold water. Careful not to splash too much, it’s still poultry and you still have to watch the hygiene, even if it’s not the dreaded chicken. Place the breasts, skin side up, on the mirepoix. I said there wasn’t any skin in this recipe, I didn’t mean we remove it before cooking. Liberally season the turkey and the mirepoix with salt and pepper, and add a few sprigs of thyme and sage over the turkey. Quarter another large orange and put the quarters at each corner of the tin; quarter a lemon and put each quarter at each side of the tin, so the turkey is covered in herbs and surrounded by citrus. Add a bay leaf too if you like that taste. 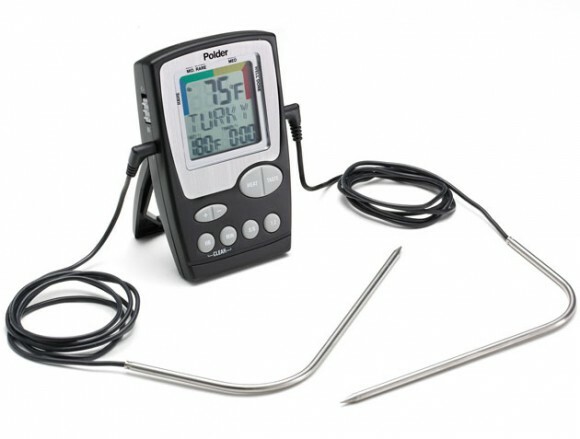 I don’t time roasts or meats when cooking; instead I do the right thing and use a probe thermometer. So at this point, I stuck the probe into the deepest part of the larger breast. Best €30 I ever spent in my kitchen. Just saying. Now, make up some stock. I’ve used chicken stock from stock pots or cubes; and I’ve used vegetable as well; this time though, I had a few litres of turkey stock saved up from the last practice run, so I used most of that instead (I saved about a half-litre, I’ll explain why later). I added all the stock to the roasting tin, and then topped it up with water until the liquid just covered the turkey (this is why you need the deep tin). Then I covered the tin with a double thickness of tinfoil and crimped it to the tin as solidly as I could, making sure the thermometer lead was feeding out okay. Now, into the oven, set your thermometer alarm for 160F (72C) and turn the oven on (from cold) to 100C (212F) (you can use any temperature down to about 80C but modern ovens and low temperatures don’t mix so well and 100C is about as far as I can push mine). Yes, that’s low. Don’t worry – when the meat hits 160F internal, it’s done and perfectly safe and white, all will be well. Now, close oven door, and go away for, oh, around three hours. That’s why the thermometer has an audible alarm – you no longer have anything to do here. No turning, no basting, no worries at all. Just leave the thing, it’s fine. After the three or so hours, when the meat hits 160F internal, take it out of the oven (btw, if it goes up higher because you were busy, it’s more or less okay to about 170F – beyond that, you’re back into tough chewy leather territory, and all this effort has been wasted). Set it aside on a trivot/silicone heat mat/cork mat/table you don’t mind destroying with heat from the roasting tin. And just leave it. At any point for the next hour or two, that turkey will remain at a nice hot temperature and be ready to serve, but if you have roast spuds or anything like that to do, just go do them now and leave the turkey sit there. It’ll stay hot and not dry out, it’ll be fine. Now, about that braising liquid. Take it, strain it, squeezing those veggies to get everything out. Chuck the strained-out solids, they’re now useless. Now, you have two options with the liquid (And you can mix and match them). Take a small saucepan, add a few tablespoons of butter, melt it over medium heat, then add in flour a teaspoon at a time, stirring all the while until this basic roux comes together; when it does, add a cup of the liquid and whisk to form a jus. Add more liquid until you get the desired consistency. Serve over the turkey. Take the liquid and pour it into a large container and put that in your freezer until it freezes into a solid block. Take this solid block, wrap it in muslin or cheesecloth, and set it in a collander over a bowl until it melts completely, giving you a muslin full of turkey schmaltz (which you could use for cooking if you’re not squeamish – chicken schmaltz is a big part of some classic ethnic jewish dishes), and a bowl full of crystal-clear turkey stock, which you can re-freeze in smaller containers for future use. (I used this for cooking the xmas turkey and making the jus so that I could make the jus while the turkey was still sitting in the roasting tin unopened). There you go – really moist turkey and jus and turkey stock to play with afterwards. Enjoy!